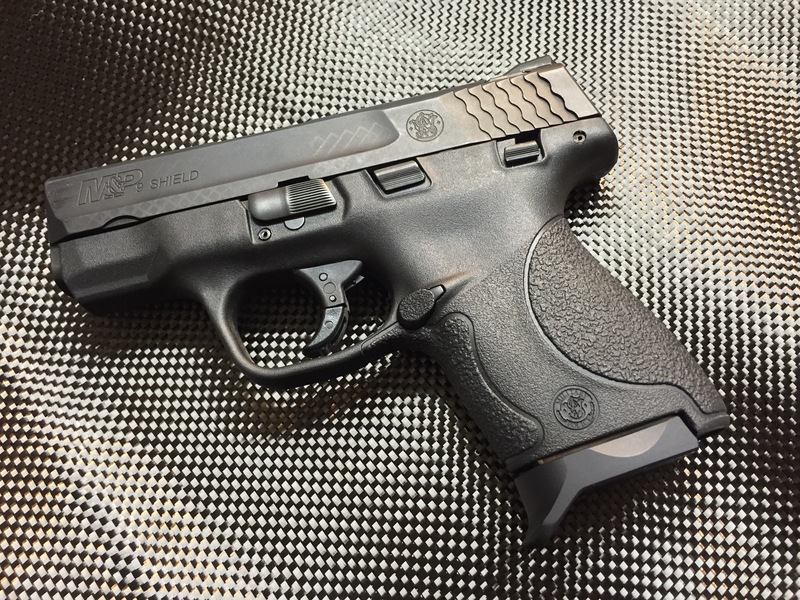 The Smith and Wesson Shield. By all accounts it is a home run and one of the best guns you can buy in that size range. In my household we have two of them; but in spite of my love for the gun, I was less than impressed with the 7 round magazine’s base pad. I really dislike wrapping my pinky finger back under the gun; I briefly entertained the thought of holding that finger straight out, but I didn’t want to look like a Duchess when I fired the gun. Ultimately it became a background issue since I seldom carried with the 7 round mag inserted. I will stop right here and quell the calls for the Pearce Grip Extension. I had a Pearce Mag Extension. ONCE! It was a +2 on a Glock 17 mag and it failed with the gun in the holster, barfing the contents onto the ground behind me. Luckily I was just burning powder at a square range and not at a competition, or worse, in a self-defense situation. Since then, Pearce anything is a no-go for me. As I tell me kids, “you get what you get, and you don’t throw a fit”, so I just dealt with the factory base pad and got on with life; then I saw the NDZ Performance Extension. It had a location for my pinky and it was solid billet aluminum goodness so I immediately bought one. Now having carried and shot the gun with it; I thought I would share my experiences, both good and bad. First, this thing is built like a tank! As I mentioned before it is machined from a billet of aluminum and even includes reliefs to help with mag extraction which work rather well, considering the size restrictions they had to work around. It has a rather nice finish and the overall quality was superb. There was only one thing that bothered me. The rear of the base pad isn’t machined to match the contour of the grip. That lack of contour causes a protrusion that digs into your strong hand, which is only exacerbated by recoil and becomes rather annoying after 100 rounds. Of course this base pad was designed (and purchased) for carry, so this isn’t as much of a serious issue as an area for product improvement. I am seriously considering performing surgery to mine once I determine the best (read: cheapest) way to refinish it. In all fairness NDZ Performance makes a model with an extended rear portion that might mitigate this issue, but I haven’t tried it and I can’t find the will to purchase it, at least not until I murder the one I own. If you are in the market for a mag extension for your Shield’s 7 round magazine, you should give the NDZ Performance Extension a look. Sold. I’ve hadn’t seen these before. I’ve checked out NDZ before, but it’s been awhile. $16 for the extended version….I’ll give it a shot. I carry my Shield daily and almost always with the 8 round mag in it because of the grip issue on the 7 rounder. Normally the extra length isn’t much of an issue, but I like options. The NDZ extended version is absolutely the way to go! LOVE mine, seriously made a difference in controlling the 7 round Shield magazine. I have found zero fault with it! Glad you discovered it and are sharing it with others! I was afraid the extension would bend or break when they hit the ground during drills, have you experienced that? Charles Daniel – That is a fair concern to have! I ran the NDZ and Plan B (Safety Solutions Academy) baseplates this summer in a 2 day 1,000 round vehicle carry course, and ran them both hard with dropping, stepping and reloading each on the hard ground surface. No cracks, stress wear or failures of any kind! Like you stated, helps to be built like a tank too. 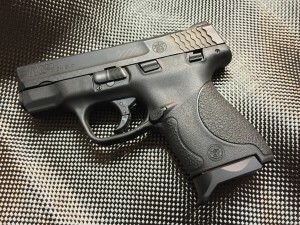 Have a Shield 40, prefer my Kahr MK or K or the M&P Compact in either 9 or 40. Pearce extensions, never had an issue with them and have been using them for years on my Kahr MK 40 and my LCP. Wow…you have a sample size of two? Guess Pearce is good to go. Yeah two different models, twice as many as the author of the article. Damn. With that kind of extensive market research you should start your own blog where you could let everyone know what’s truly up. And charge for it! That kind of info doesn’t come cheap, why give it away? I am glad the Pearce extensions work for you, but once an item fails me, I seldom go back. As a mechanic by trade, I will not tolerate tools or parts that don’t work the first time, every time. Did I miss something? My 9mm Shield (bought in 2014) came with a 7 rounder (I hate it same as you for same reasons) and an 8 round mag with the finger extension that makes it perfect fit for my large hands. I found another S&W factory 8 round M&P Shield mag easily at a local gun show. So these factory 8 rounders use the “Pearce Extension” that you reference? Both are working great for me no issues with being in any way loose or unstable. I guess I’m just willing to buy another couple of mags, rather than mod my 7 rounder to make it into an 8. The OEM 8 round extension is NOT made by Pearce and is good quality (aside from sliding up the mag). I wanted an extension on the 7 rounder. The loose piece on the OEM extended mag is exactly why I don’t like that mag and therefore why I don’t care for my Shield. It has pinched my skin more than once while changing out magazines. I suppose it could be glued into place, if I were inclined to do so. I have tried 5 minute epoxy and it broke loose the second time the mag hit the pavement. I am trying some Milspec sealant that is flexible, which is surprisingly affordable for an aviation based item. So, wait, to recap: you gave up something that was uncomfortable to shoot as a carry gun for something that was uncomfortable to shoot as a carry gun? Yes, but with the caveat that I can round off the offending edge of the NDZ unit and I still have an aluminum extension that has a pinky area that fits me. Ironically the comments have led me to believe the NDZ extension with the tang, as referenced in the article, would probably work better for me. For the 8 round, this is not better. I use it for the 7 round mag. Maybe I’m being dense, but, uh, why not just carry with the 8-round mag? Shelley – The 7 round NDZ unit allows users with larger hands to grip it properly or better than the factory base pad. 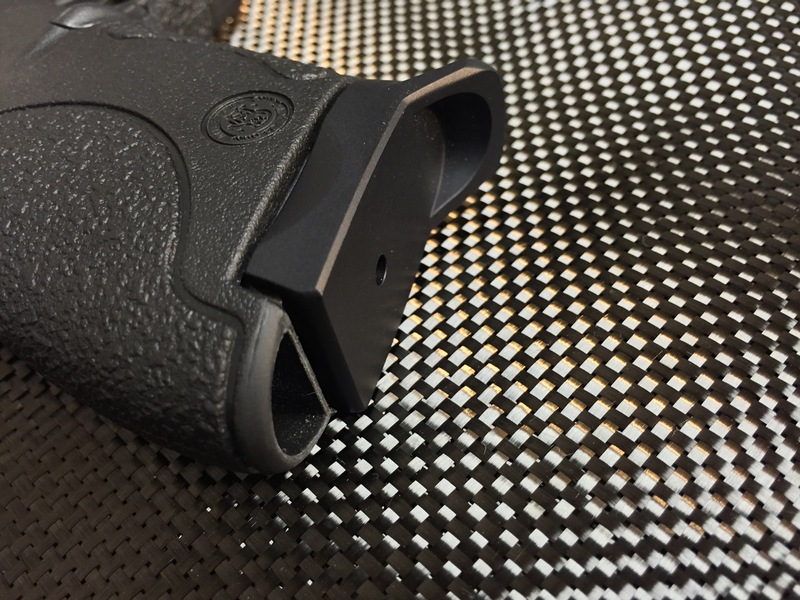 The point of using the NDZ unit over the standard 8 round magazine is for the fact the NDZ unit basepad is still slightly smaller profile and printing than the factory 8 round mag shows concealed. Now I can utilize my 7 round magazine, as opposed to having to carrying my 8 round every time. The difference may be negligible for some folks, but makes a difference for my particular body type, dress style and lifestyle. I do carry a 8 round spare magazine on my opposite side, with a Safety Solutions Academy Plan B mag unit. 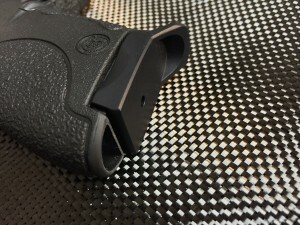 Eliminates the “pinching” issue some folks encounter with the Shield 8 round magazine.